Originally published August 10: The number of organic local listings on desktop and mobile has shrunk from seven to three. The new three-result Local Pack replaces what was previously a Local 7-Pack. Also from the original post: A new ad type in beta, Home Service ads, could squeeze out organic listings for home service providers from the Google first page. Added August 24: Google mobile results are ad-dominant. Sponsored listings take up all above-the-fold space for many location-specific and non-location-specific queries. Taken together we see a series of changes that eliminate truly organic local listings on Google’s first page. The remainder of this post has been updated to reflect three recent changes rather than the two originally included in this report. In the last weeks, Google local results shifted in three significant ways in which local businesses should take note. Fewer local organic results display on the first page. Google is testing a new search ad format for home service providers that could ultimately replace organic local listings. Google is beta testing Home Service ads. To be included in this coveted space, service providers must meet the most stringent qualifications for advertisers yet, including background and license checks, online reputation checks and mystery shopping checks. Home service providers are primarily made up of local businesses, so organic local listings are getting the SERP real estate squeeze. On mobile SERPs, above-the-fold (ie., before-the-scroll) results are all ads. Google confirmed that it will display three text ads above the fold of mobile results. For some local-intent queries, Google is testing a local SERP layout with three sponsored (ad) results and a map. Mobile searches have more of a local-intent lean than desktop searches. Displacing organic listings from the first view of a mobile SERP significantly downgrades the visibility of local organic results. With fewer organic local results displaying in the local pack format on Page one, businesses with store locations will be strongly impacted. We started seeing the new results consistently across all SERPs for all clients with brick-and-mortar locations late last Thursday night (August 6). Google hasn’t made an official announcement regarding the change, but considering the speed of the rollout and its permanence in all our test queries, we’re certain the change is a permanent one. The immediate impact here is obvious. If a business ranks outside of the top three local results organically, visibility will be substantially impacted. The top three results are all that matter now when it comes to Google My Business (GMB) local listings. A local 7-Pack for “real estate olean ny” featured by Mike Blumenthal on his blog in May 2015. The 7-pack has been replaced by a new local pack that contains only the top three results. A new local pack for the query “hardware store” published in Search Engine Land on Friday, August 7. On desktop and mobile, the phone number and full address for businesses are no longer displayed on the SERP. The street name and hours now appear on the new local pack as well as “Website” and “Directions” buttons. This should impact the number of people who visit local business websites from local SERPs, as previously there was no direct link to the website from the local pack. It also eliminates the ability of the potential customers to dial or visit the store without interacting with the local listing in some way. This is a very deliberate change by Google; there was a substantial amount of store calls and visits that they could never attribute to their SERPs prior to this change. Now if a searcher wants the information, they have to click through to get it. It’s also important to note that clicks on the business name itself no longer take searchers to the business’s Google+ page, but instead take them to a “local finder” page that shows the expanded listing information for the result they clicked on, along with an expanded set of local results. Clearly here Google is cutting ties between Google+ and local, choosing instead to feature a hybrid of their maps products and removing any paths to the Google+ business pages that they previously required businesses to create in order to be listed in local search. 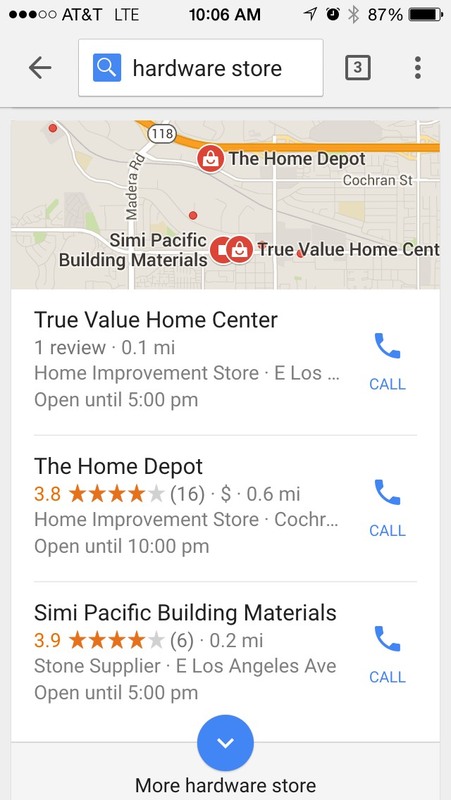 A new local pack result for the query “hardware store” snapped on an iPhone on August 10. On mobile, the website and directions links that appear on the desktop SERP have been replaced by a single “Call” button. The phone number is hidden, and we suspect that this is also intentional. A brand new type of local sponsored listings began showing up at the end of July. For SERPs that provide home services, Google is testing a stack of ads called Home Service ads that dominate the top of the page. In July, Google acquired Homejoy, an online service connecting customers with house cleaners. At the time we reported on speculation that a new feature may be in the works to connect home services providers (house cleaners, plumbers, roofers, etc.) with people searching for home improvement terms, right in the results. That feature is certainly what we’re seeing today in the beta test available in the San Francisco Bay Area. While home service ads are currently only available for businesses in the Bay Area, we see a connection between them and the larger changes to Google’s local space. On the SERP for San Francisco plumbers, there are no local organic listings on the page. Is the end goal of all the changes to Google’s local search results monetization of local across the board? Previously our post closed with the question above: Is the end goal of these changes to monetize the local SERP? As if in response, Google appears to be testing nearby business ads — three sponsored listings and a map — in local-intent SERPs. With the local pack shrinking organic SERP real estate, there will be businesses that find they are knocked off Page 1. For business that meet the qualifications and have enough budget to pay to play, ads may be their best and only option to get back that Page 1 visibility. Personally i don’t like 7 pack because, it will totally affect the organic results.This is a nice move from google. every time Google makes change every runs around saying SEO is dead , this is no exception ! Google can not get rid of local SEO its too much part of their quality in search , sure they are looking to modify it to sqeeze more cash but ultimately it won’t go away. As if Google isn’t wealthy enough, now they want even more. In the process they are hurting instead of helping local businesses. They are more interested in taking money out of the local businesses pockets and putting it into their own. Somehow I get the feeling that Yellow Pages and other phone books will be cheering, thinking this will help to revive their business. First organic and now local – it’s a pay to play world on Google and like SEO firms that once flourished in organic, potentially devastating to Local SEO’s. The 7-Pack was such a gift to smaller businesses and it is now coming to a Pay to Play world on Google. Who thinks Bing & Yahoo will follow suit? Google really shake local SMB’s with this change. You’ll still see spam listings rank but definitely somehow quality is better than before. However, I personally never think of less-than 4 listings. I also do think, it’ll force atleast some of the local SMB’s to use adwords & show on top with their local listing. With every change like this that Google makes, it becomes a little more clear (and concerning) that their SERPs are not as egalitarian, transparent, or comprehensive as expected. Their SERPs are looking less like an old-fashioned phone book and more like Cosmopolitan magazine. A very interesting piece. We have already started to see the reduction from 7 to 3 over here in the UK. It is now about providing greater localised info on the client websites to ensure they rank in those top 3 SERPS. Thanks again for your article. Google is an advertising company that has several search portals to garner clients, and the sane search portals garner customers for those clients… unfortunately thinking they are a ‘search’ company is becoming very short sighted. Hi again, Sergey. Yeah, I hear that. And you sum up the issue eloquently. Soumya, you’re right about that problem! I hadn’t considered that drawback yet. Definitely makes a website now the only option. It was just a matter of time, really. Virginia, personally I welcome this change as my education company Promozseo is coming on the first three, for most of the related searches but at the same time, it’s getting difficult for local businesses to rank on local results. The new design looks beautiful, clean and user-friendly (my thinking). The main problem I saw is, if you do not have a website you won’t be ranking on local results anymore. Google stopped showing G+ page link on first three sweet spots. Overall, I personally loved this change so far. Virginia, thanks :). I always thought that Google would like to show their users the best results possible, be it a regular guide on a certain topic or a local business servicing their area. In order to be deemed “worthy” to be shown in local 7 pack business had to do certain things like build citations, provide high quality service, post interesting high quality content, you know, everything that makes sites rank well. Now it is all thrown out of a window. Google “san francisco plumber” and see what kind of results it will show. 80% of either paid placements or close to paid like Yelp, YP and AngiesList… This is what bothers me. 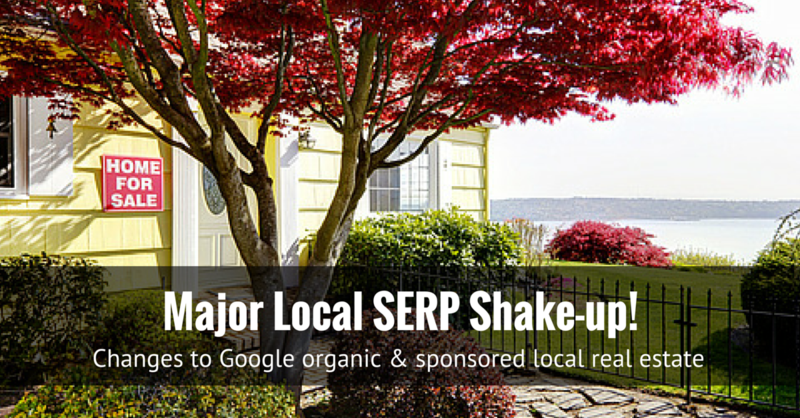 Unwelcome change to all local SEOs and local business owners. The age of relatively cheap leads from Google is over and now if you’d like to get a piece of that traffic, be ready to pay for HomeAdvisor-ish style model… I’ve named this update – “Middle Finger to Local Business Update”, I think it sums up well what just happened here.